Our British Military style dogtags are laser engraved on 38mm diameter 304 stainless steel tag with a matte non-reflective finish. The dark laser engraving creates a modern looking, dark and deep impression that will not wear down or rub off. Silencers can be optionally installed. Used by the Royal Navy (RN), Royal Marines (RM), British Army, Royal Air Force (RAF), SAS. 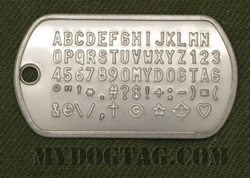 What is the British Military Dogtags format? Superscript numbers (i.e. 17) denote character column. See Official military documentation for British Military Dogtags specifications. 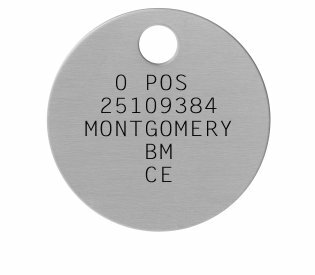 Enter your info into our British Military Dogtags generator form below to quickly create your own personalized set. Overwrite the light grey text with your own information and then click the Preview button to see what your tags will look like! You can then make optional changes to your design or choose difference chains and silencers. Watch this YouTube video for a demo. Alternatively you can design your tags free-form (without the template) or use our pen-and-paper mail/fax order form. On the next page you can make further changes to each line on the tag. NATO countries such as Canada and United Kingdom are military allies of the United States and we are pleased to offer their uniquely shaped dogtags in recognition of their historic military alliance. Are you a veteran who lost his dogtags years ago? We can make you a new set that look almost identical to your originals depending on when you served. We also offer a Veteran discount! Recreations of personal historical dogtags from specific war eras make sentimental souvenir mementos to honor the memory of a loved one. Commemorate your grandfather, father, or other family members who served in the military with a recreation set of replica dogtags to match their originals lost-in-time. Is one of your relatives in the military? Support your soldier with a Military Family Dogtag. All orders are shipped within 1 business day and are usually delivered within 1 week (in North America). If you need any assistance creating or ordering your British Military Dogtags please contact us directly, we are here to help!